Your smart phone will be faster than your desktop computer and this will happen sooner than you think. Even before the Cortex-A9 – the new ARM processor is to ship out, ARM today released its new Cortex-A15 chip and claims that the new chip will make smart phones run five times faster for the same amount of power consumed. The new Cortex-A15 is said to be the next generation chip set which will be used in mobile devices including tablet pcs. The new chipset will be available in either 32nm or 28nm size formats and can run at 2.5GHz clock speeds for the same power consumed as of today’s devices. 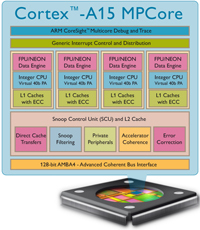 Mike Inglis, the general manager for ARM’s processor division said, “The Cortex A15 MPCore processor will become the next major step along the industry’s energy efficient computing road map and open up a wide range of new application possibilities”. The Cortex-A15 also offers hardware support for virtualisation which will let smartphones run multiple copies on itself, a useful tool where one version of the phone could be set for business and another for home. The Cortex A15 is able to work with the same software as the other Cortex A processors and users could run all their applications without having to upgrade. The Cortex-A15 also has support for one to four way symetrical multi processing and can address memory sizes of up to 1 Tera byte (1000 GB). ARM said many companies have shown much interest in the new Cortex-A15 and Samsung has already signed up with ARM as a partner in the project. So can we expect a 2.5GHz Galaxy Tab soon?